Mr and Mrs. Steve Fritzler, Alliance, Nebraska, purchased Lot 115 at $9,000. 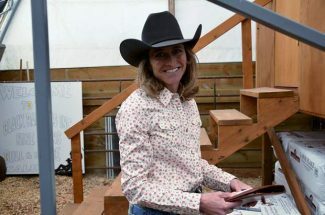 Holli Sollenbarger of P Diamond Livestock, Rand, Colorado, bought Lots 4 and 53 at $8,750 each, along with other purchases. Ron Iossi, Alliance, Nebraska, purchased Lot 123, an Angus bull. Location: Black Ranches Sale Barn, Antioch, Nebr. 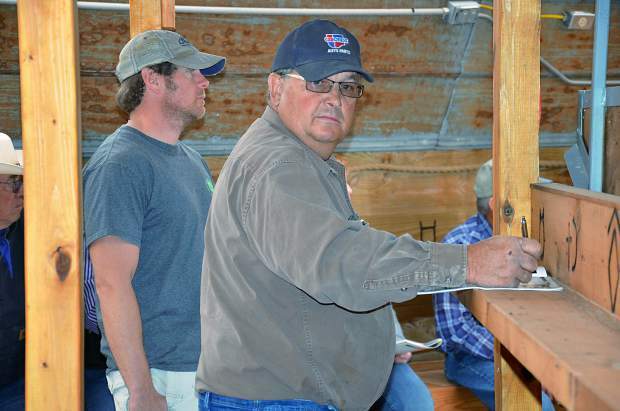 Auctioneers: Tracy Harl, Hastings, Nebr. 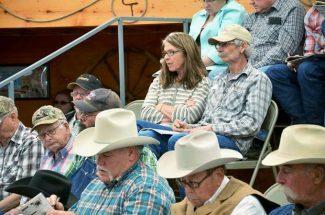 The Black Ranches, Inc., hosted a big crowd for the Nine Irons Seedstock annual bull and female sale. 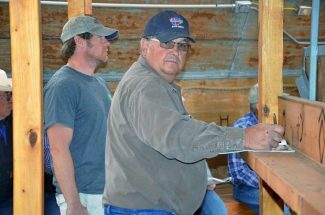 Six producers from Colorado, Montana, and Nebraska work together to offer this quality set of Composite and Angus bulls. Producers involved are Butch and Peg Black, Karl and Janice Hueftle, Darold and Lorna Tomsheck, Lindner Ranches, and Vince and Lori Poppe, along with Jake and Bree Poppe. This was a very aggressive sale, and proved to be the best ever for the Nine Irons crew. The Nine Irons Seedstock group believes that cross-breeding will add pounds to any program through hybrid vigor. In conjunction with heterosis, integrating low PAP tested sires on cross-bred females achieves additional benefits. Low PAP test scores, 44 or less, predict the survivability of cattle. The PAP test is an artery blood pressure procedure to evaluate a bull's ability to thrive in higher altitudes. The entire offering consisted of bulls that were presented in excellent condition. These bulls had been challenged enough to prove their rates of gain, but still in modest flesh to assure their soundness and longevity. The top selling bull of the day was an Angus bull, Lot 111. From the Tomsheck Ranch, TDL Ten X 3115B was a son of AAR Ten x 7008 SA, and out of a daughter of Raindance 2503. He was born at 65 pounds and weaned at 613 pounds. This calving ease bull had EPDs of CED 10, BW -1.5, WW 64, YW 117, MILK 22, and $B 119.98. Selling for $12,500, his new owner was Black Ranches/Lazy Nine Partnership. 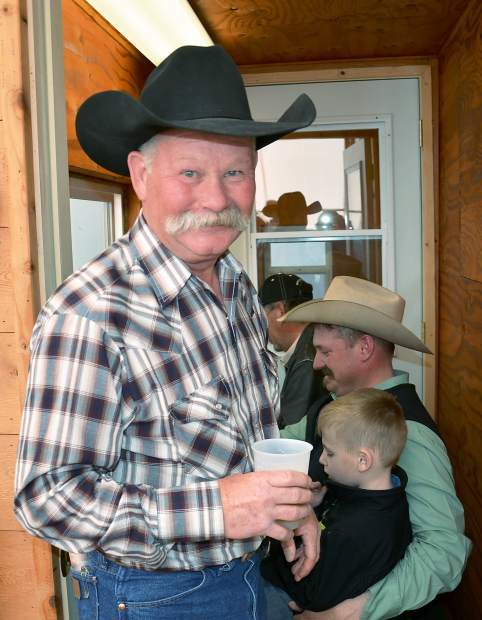 Chad and Brenda Brown of Owl Mountain Ranch, Rand, Colorado, made their top selection with their purchase of Lot 33, a composite bull, at $9000. From Vince Poppe, PCC Chain Gang 4209B was sired by NIS Express 7131Z and out of a daughter of Franchise 3124U. This black bull, with a 16.5 sq. in. rib eye, was 63 percent Angus, along with 34 percent Simmental and 3 percent Gelbvieh. Born at 65 pounds, he weaned at 625 pounds, reaching 1165 pounds as a yearling. This black calving ease bull had EPDs of BW -1.1, WW 58, YW 109, and MILK 24. Lots 4 and 53 were both composite bulls, selling for $8,750 each to Justin and Holli Sollenbarger of P Diamond Livestock, Rand, Colo. From Jake Poppe, we had Lot 4, PCC Casino 5127B, a son of NIS Hall of Fame 7102X. Out of a daughter of NIS Powderhorn 6002Z, he was Born at 67 pounds, he weaned at 635 pounds before growing to a yearling weight of 1170 pounds. He posted EPDs of BW -0.6, WW 59, YW 101, and MILK 24. This black bull was 59% Angus, 33% Simmental, and 8% Gelbvieh. From Vince Poppe, Lot 53 was a son of NIS Express 7131Z, and out of a daughter of Mytty In Focus. This black bull was born at 74 pounds, weaned at 655 pounds, and attained a yearling weight of 1225 pounds. He had gained 4.1 pounds per day and had a 13.2 sq. in. rib eye. He was 63 percent Angus and had EPDs of BW 0.5, WW 65, YW 117, and MILK 24. Padlock Ranch from Ranchester, Wyoming, was busy bidding on bulls and purchasing in volume on sale day. This was also a good day to pick out a working horse for your ranch. A nice group of saddle horses were offered, with the highest priced horse, BRI Buff Hancock, selling for $6750 to Ed Dentler, Lakeside, Nebr. This 2008 Grulllo AQHA gelding seemed ready to go to work. The hospitality at the Black Ranches and Nine Iron Seedstock welcomed you to an enjoyable afternoon to view quality bulls and to sample the variety of good food. Beverages were plentiful and the grilled steak at the end of the sale was as good as you will find anywhere.